Today's image comes from a recent morning trip to Kenilworth Park and Aquatic Gardens in DC. This park is unique in that it is the only National Park dedicated to the cultivation of aquatic plants (and I believe the only National Park solely dedicated to cultivated flowers at all). There are many ponds full of lotuses and water lilies along the banks of the Anacostia River. 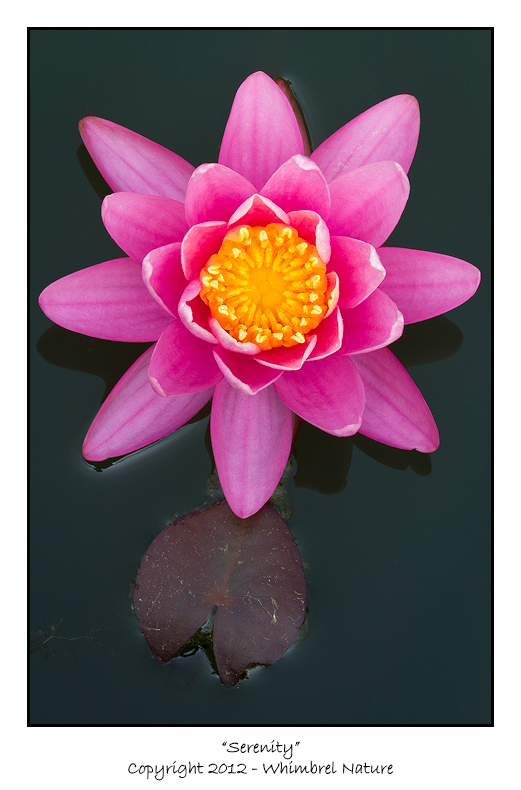 I made the image of this vibrant water lily in a small pond tucked behind the visitors center. I was on my way out at the end of a very hot morning. There weren't many lilies in these tanks this time of year (in fact one of the ponds was being "planted" while I was there). This meant that this lily was all by itself, which was perfect for my purposes. I was also lucky in that this specimen was blooming very close to the edge of the tank. So by raising my tripod to its full height, setting the legs right at the edge of the pool, and slightly cantilevering the tripod forward, I was able to shoot pretty much straight down on this blossom and keep the surface of the water parallel with the sensor plane of the camera. Look for more images from this trip in the coming week. Wow, a perfect name for this image Elijah! It is serene and beautiful. Thanks Mia. Sorry to hear about your image theft problems. I've found two foreign sites that are using my images without permission (at least they gave me credit). Unfortunately I'm not sure what to do about it as the contact info for the sites are in Korean and Japanese respectively.